A guy toward the back who looks like a tall, introspective Dustin Hoffman responds to the challenge. Q: At age 12, you had every expectation of the secret of life being revealed to you on Confirmation Day. If as the adult Michael you could travel back in time and whisper in the ear of your younger self, what would you say? A: There is no death. The Earth is your paradise. Look within. A: Selling ice cream from a bicycle. I like the element of surprise – showing up unexpectedly with a treat. Q: You spent your 21st birthday in an unexpected venue and for a reason that could cause many people to raise an eyebrow. What was it, did you ever do it again, and what did the experience teach you? Q: Music is a recurring theme throughout the chapters of Onward and Upward. If you were involved in the music scene today, what would you be performing/producing? A: Indian tabla, of course. Q: What was your inspiration to become a publisher and launch Michael Wiese Productions? A: Necessity! Twelve publishers rejected my first book, I had to do it myself. It sold 50,000 copies and I started publishing other writers as well as my own books. Q: With so many screenwriting and filmmaking books out there on today’s market, what do you feel keeps MWP sustainable? In other words, do you ever worry about running out of topics to cover? A: We provide information that has – until now – been closely held film industry secrets. We kicked open the doors with our books. Like Mother Nature, we will never run out of ways to express ourselves creatively. There are many facets on a diamond. Q: You recently launched a new imprint, Divine Arts. Tell us about it and the correlation to your own spiritual journey. A: We are in service to provide a conduit for sacred knowledge, both ancient and emerging. Divine Arts books demonstrate how one can bring mindfulness to daily life and reconnect with the sacred nature within. Q: Having spent so much time behind a camera, which is the greater challenge for you – to direct the energies and skill sets of other people to deliver your vision for a documentary or to exercise the solo discipline of putting your thoughts on paper every day and writing a book as deeply introspective – and humorous – as Onward and Upward? A: Having Parkinson’s has made me refocus and reduce my energies toward a one-man band kind of filmmaking. I no longer have the stamina for crews and 14 hour days. I may hire assistants to carry the gear or an editor to help put the film together, but my challenge nowadays is to make small, personal, sacred journey films on a micro-budget. Books or films all require a disciplined and committed approach. Q: Documentaries that seek to introduce the world to little-known cultures often do so at the price of foisting “civilization” on tribes that were perfectly happy being ignorant of modern trappings and technology. What is your advice to aspiring documentary filmmakers insofar as doing no harm in their quest to bring home a compelling story? A: Walk softly. Don’t leave a footprint. Be very respectful. Bring as little equipment as possible. Leave the ‘video circus’ at home. Q: How does the Balinese connection to the divine that you observed and experienced in your 20s help you to stay focused and positive in dealing with your recent diagnosis of Parkinson’s? A: I focus on the daily miracles of what I can do: Seeing and smelling the flowers in my garden. Hearing the ocean and birds singing. Feeling the breeze and warmth of the sun. Like the Balinese with their constant offerings, I give gratitude daily. Q: For you, what are the distinctions between being religious and being spiritual? A: Religions ask you to believe. Believing what someone tells you to believe is not very useful. Having an experience of the divine makes the spiritual real for you. Q: The chapters of Onward and Upward are replete with anecdotes of famous people with whom you have crossed paths and drawn inspiration. Is there anyone you wish you could have met and if so, what question would you most like to have asked him or her? A: I’d like to ask Robert Johnson if he really sold his soul to the devil at the crossroads? Of Einstein I’d ask how many dimensions are there and who lives there? And I’d ask Carl Jung why he didn’t publish The Red Book when he was alive? Q: When you learned that you were going to be a father at age 45, what was your first thought? A: Forty-five is the new thirty-five! Q: Had you met your beloved soul-mate Geraldine 20 years earlier, what would your approach to parenting have been? A: No difference. Babies didn’t come with an Operating Manual then either. Q: Parents often tell their children, “Do as I say, not as I do.” Has Julia shown signs of emulating the wild and crazy days of your own youth? If so, what’s your response going to be? A: You bet she has! It’s natural and healthy to experiment and test the world. Q: What’s the most recent movie you saw and what did you most love/hate about it? A: “The Cave of the Yellow Dog”. A wonderful Mongolian film about a nomadic family. Q: What inspires you the most about living on the Cornwall coast? A: It’s elemental magnificence. It’s like Big Sur on steroids. Q: What would most people be surprised to learn about you? A: Just about everything I write about in Onward and Upward. I’ve been many people and had many lives. Most people who know me see only one face. The book reveals all! A: An esoteric quest in Sicily. An interactive e-book. The first screening in London of my latest film, “Living with Spirits: 10 Days in the Jungle with Ayahuasca”. 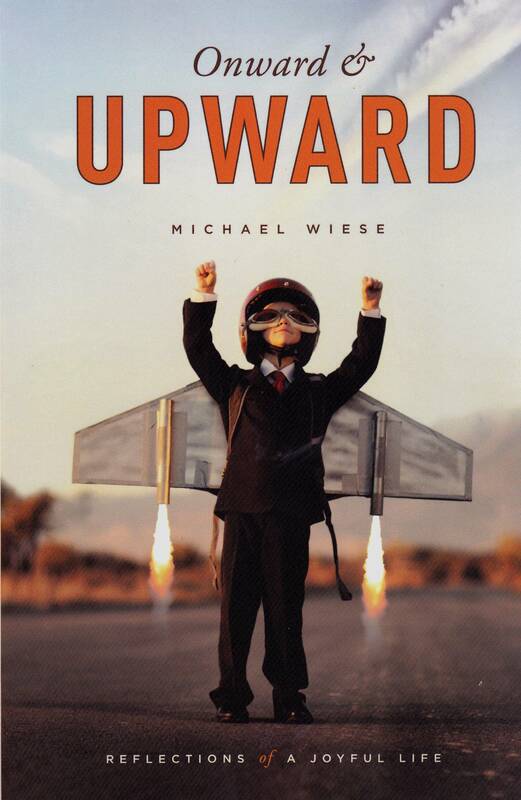 Onward and Upward is available now through www.mwp.com or Amazon.